Energy saving projects often creates different side effects in addition to the expected energy savings. These side effects can have significant value and even far exceed the value of the saved energy. The side effects are called non-energy benefits (NEBs), and the term refers to all side effects that may arise after implementing an energy saving project. Examples of NEBs are reduction of waste, maintenance costs, emissions and production downtime as well as improvement of indoor climate, safety, product quality and many more. The NEBs are easily underestimated in the process of an energy saving projects and during the evaluation of the project. 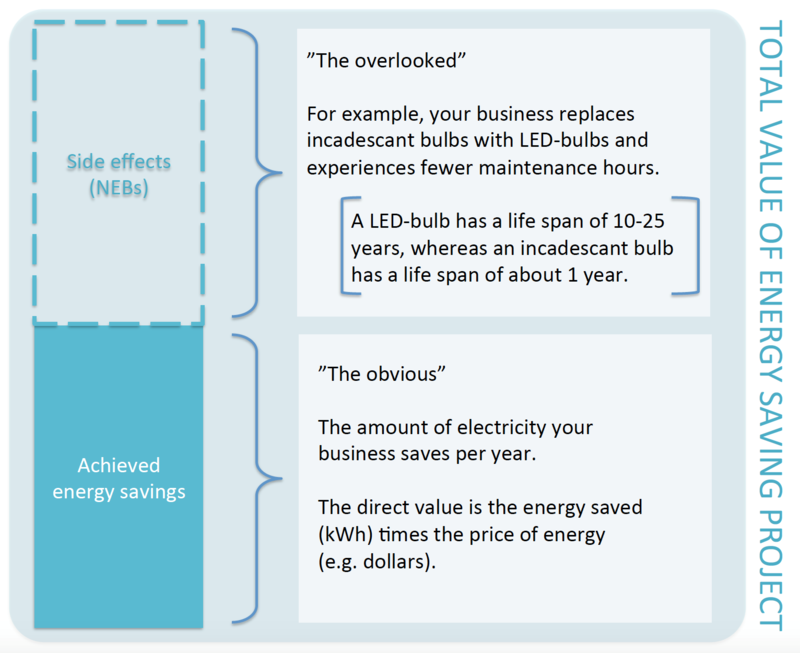 The figure below illustrates a case of an overlooked side effect (NEB), which is part of the total value of the energy saving project. This tool offers a method for assigning value to NEBs and making them visible. The types of NEBs and their value will differ from project to project. Visualization and valuation of NEBs will make it possible to include these side effects in assessing the attractiveness of an energy saving project - for the mutual benefit of energy advisors and their clients.